Prior to undergoing any medical procedure, it is important to empower yourself with as much information as possible, which requires a candid conversation with your doctor. All procedures have risks, benefits, alternatives, recovery periods, and other factors to consider. An open and thorough discussion will help you achieve the best medical outcome and also reduce your fear and anxiety. Below are the top six questions to ask your doctor before undergoing a medical procedure. 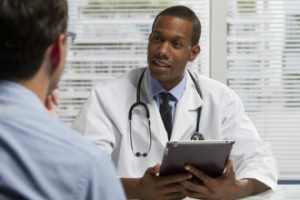 Before agreeing to any medical procedure, you have the right to know what exactly the doctor plans to do to your body. This includes a detailed, understandable description of how the procedure will be performed and the type of pain control (anesthesia) that will be used. It is imperative that you understand all the risks and benefits before agreeing to any procedure. Except in life-threatening emergencies, or other limited circumstances where someone other than the patient must provide consent, your doctor is required by law to obtain your informed consent before performing any medical procedure on you. Obtaining your informed consent contemplates back-and-forth, face-to-face communication between you and your doctor. This is your time to ask about possible risks, such as infections, pain, bleeding and the possibility that other procedures may become medically necessary. It is also the time to fully educate yourself regarding the benefits associated with the procedure, how long they will last, and whether other medical intervention will be necessary in the future. The worst thing you can do is to simply sign a consent form presented by your doctor without asking any questions. Sometimes medications or lifestyle changes, such as proper diet and exercise, can be an effective first option before undergoing a medical procedure. Be sure to ask whether the proposed procedure must be done immediately, or whether it is possible to first try less-aggressive alternatives. What is your doctor’s experience with the procedure? For obvious reasons, you want your doctor to have significant training and experience in doing the procedure. Don’t be afraid to ask about how frequently the doctor performs the procedure and the general success rate for patients. Not all medical facilities are created equally. Although outpatient surgical centers successfully perform millions of medical procedures in the U.S. each year, they do not always have the highly trained staff and life-saving equipment necessary to deal with emergencies. The same holds true for procedures done in doctors’ offices. If your doctor is recommending a setting other than a hospital, find out why and what protocols will be in place if complications arise. Planning for recovery is just as important as planning for the medical procedure itself. Appropriate lines of inquiry include what to expect immediately following the procedure as well as during the longer term. If you will be hospitalized, what is the expected length of time? What medications, medical supplies and equipment will be necessary when you go home? How long will it be before you can return to work and your normal daily activities? When possible, plan your questions in advance and write them down. Taking the initiative to be a well-informed patient will help you achieve the best medical outcome for your situation. The information attained will be well worth the effort.